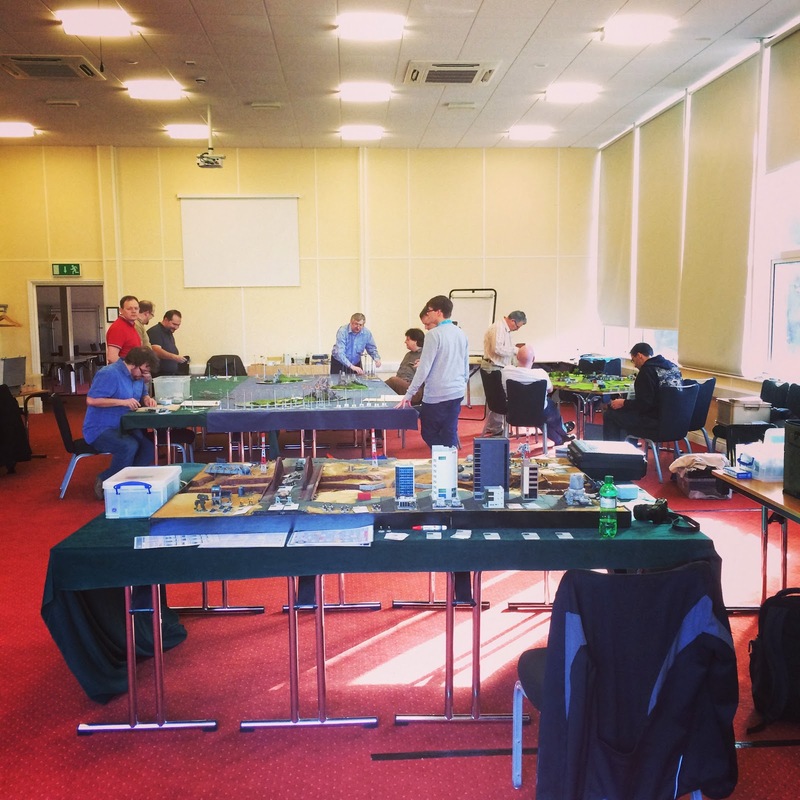 This last weekend was a full immersion Gruntz 15mm event at a fantastic British country pile called Stoke Rochford Hall. 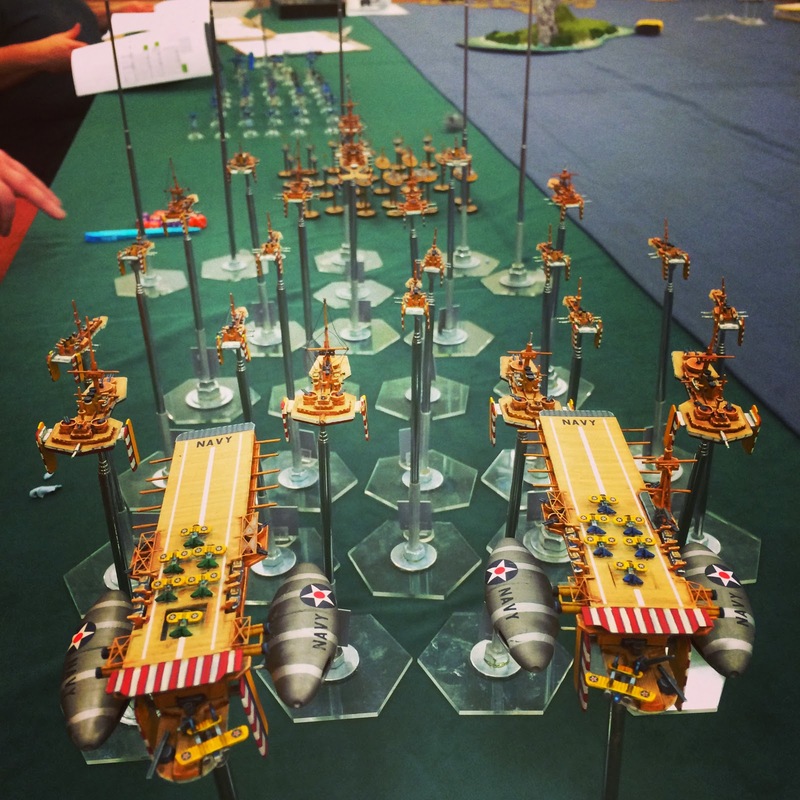 There was a mix of Aeronef games (Victorian SCI-FI lighter than airships) and 15mm SCI-FI with the Gruntz rules. 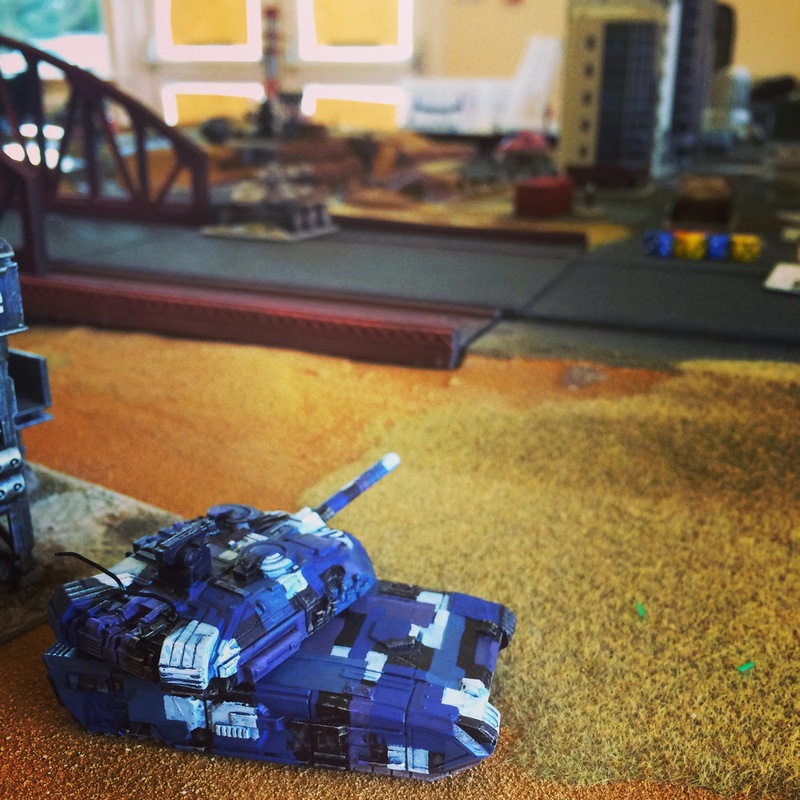 I had some great feedback from players and a very relaxed game. Rather than a typical show, where I hardly get time to take a breath, it was instead a calm environment where we were able to focus on the game undisturbed. 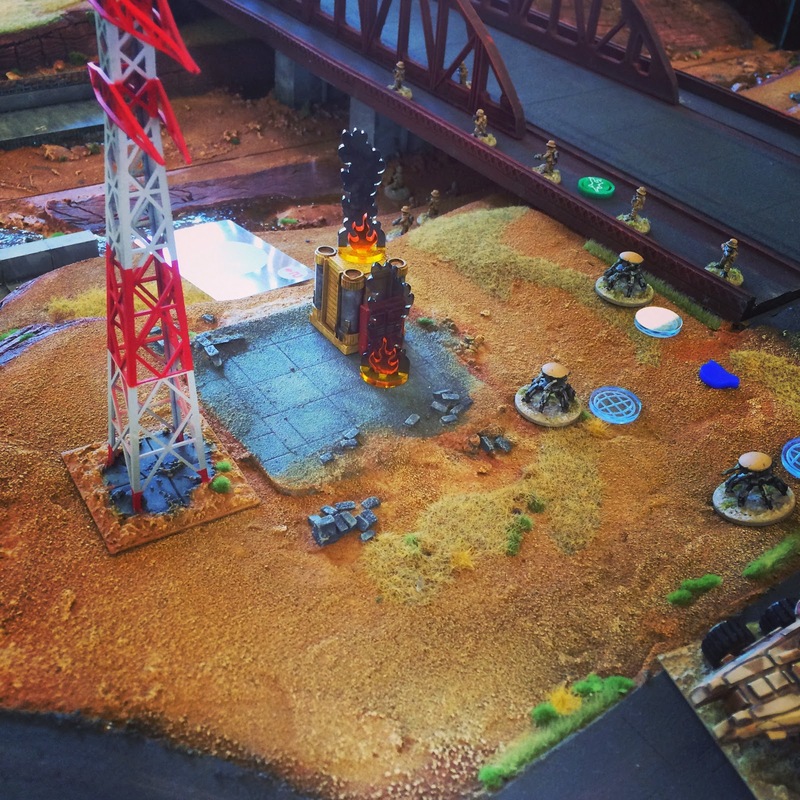 Brigade Models were at the event with a small trade stand, so it was very difficult to avoid spending money on new models! Brigade have some great new 15mm vehicles and also an extensive growing line of 2mm terrain for their Aeronef and Land Ironclad games. With regard to the Gruntz game we used the card activation which is perfect for larger groups when you have 4+ players around the table. Players activated Squads and vehicles based on the card rank and any units assigned aces drawn (face down) are given a boon which is a small bonus to shooting, guard or speed depending on the suit of the card. Any jokers randomly assigned to a unit is bad luck because they will be activating last with a negative to most skill tests on their activation. This represents a breakdown in communication or minor mechanical failure which disrupts them. 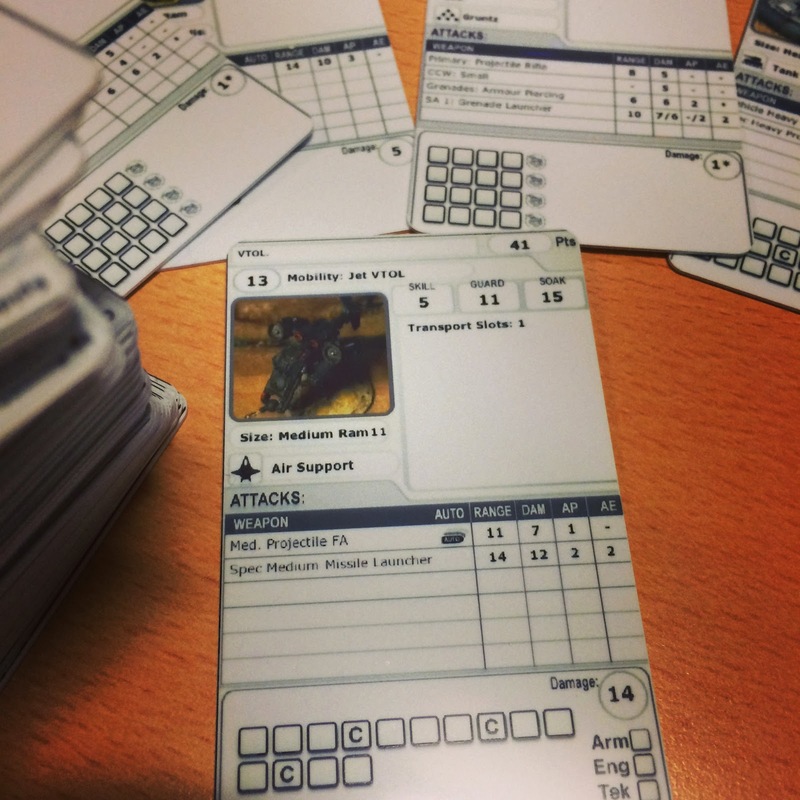 For Gruntz I used some pre-prepared profile cards that helped with referencing the models. Here is a sample set which I printed onto credit card plastic. Being printed on plastic allows you to use a wipe board felt pen to mark damage and then wipe it off for re-use again after the game. I am looking at producing a set soon and will be confirming details on what models and army lists to produce. 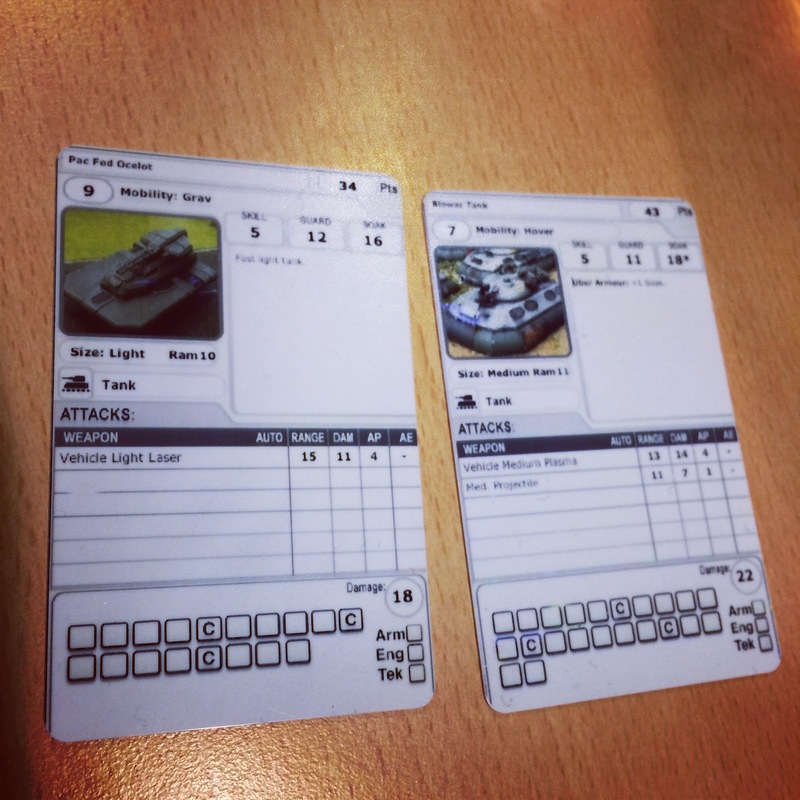 A nice feature of Gruntz is the flexibility to build your own vehicles, however there are certainly players that would appreciate some pre-made cards making it very quick to get in a game. One key item of feedback from the players was the need for guidance in creating profile cards. Several of the players used Skill4 and Shoot4 for vehicles and squads. This is a good base statistic, however a 5 in shoot is makes for a slightly quicker game because you are going to hit more often. It really depends on how you want to play the game, however Skill5 and Shoot5 is about the optimum level for a fun game. I personally like to mix it up by having the odd Skill4 and Shoot6 Gruntz squads mixed in as green or elite troops respectively. If I had some civilian or basic untrained models on the table that were using pistols or basic weapons I may give them a Shoot3. They won't stand much chance against a well armoured and trained target but they might get away with a lucky hit or two, especially if they concentrate fire on one single target. It really depends on how you want to play but my key advice would be to avoid too many units on 4 or less and equally don't field a dozen squads at shoot6 because they at the veteran end. However it does balance out because you will be able to field more units at the lower points cost for the Shoot score. If in doubt pick Shoot5 and Skill5, especially for your first few games to get a good feel for a fun game! 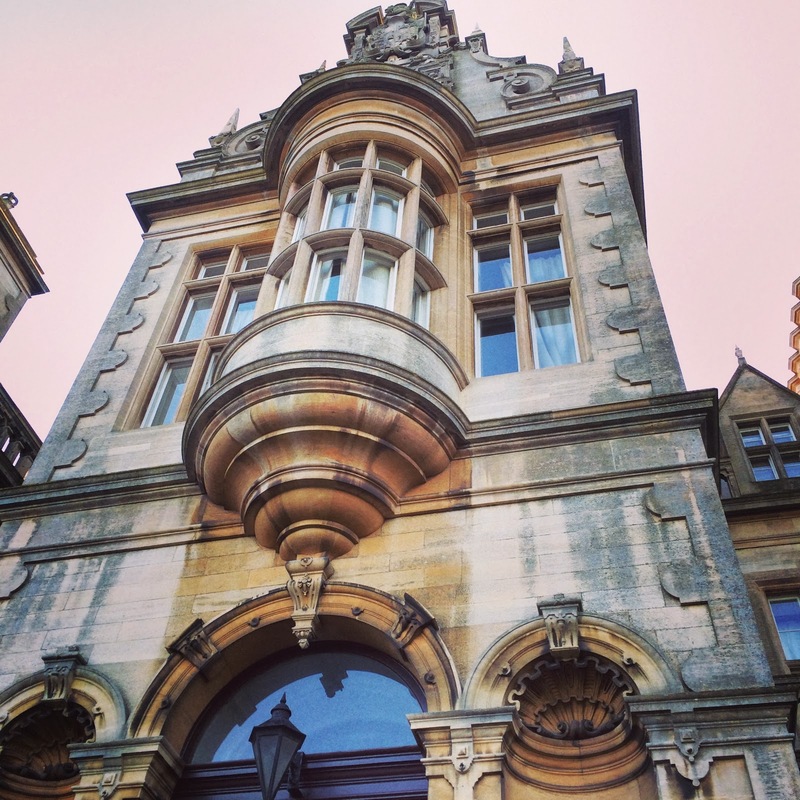 Here are a couple of photos of the Stoke Rochford Hall. At night these railings looked spooky with that classic Hammer House of horror feel to them. It was a great place to stay and ideal setting for the Victorian SCI-FI game Aeronef that was played along with Gruntz. 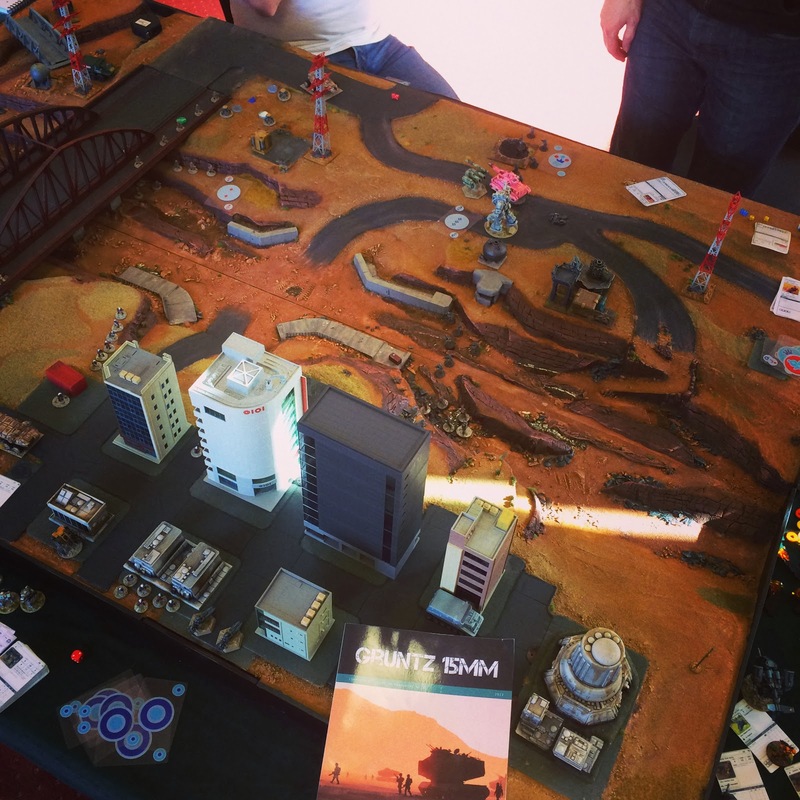 The Gruntz game on day1 of the event was a classic invasion and destroy the bridge on resource rich planet. The bridge was spanning a river that was only flood once a year in a rare rainy season. 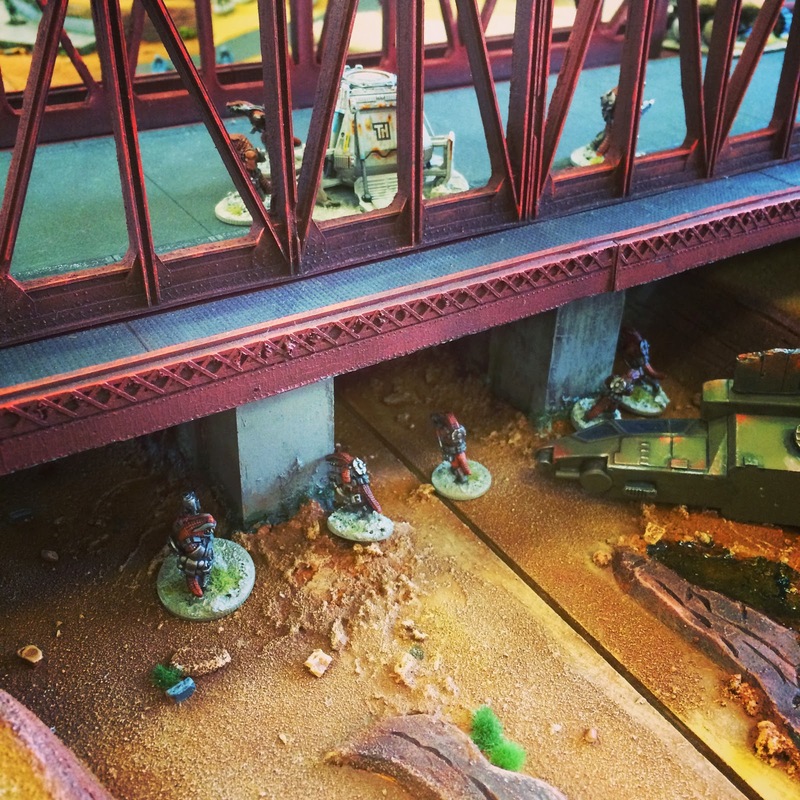 An alien lizard race (The Garn) were attempting to place demolition charges on the bridge. The Garn from Khurasan are a race that use shielding tek rather than heavy armour and the personal shields perk was given to them to provide the extra amour soak. 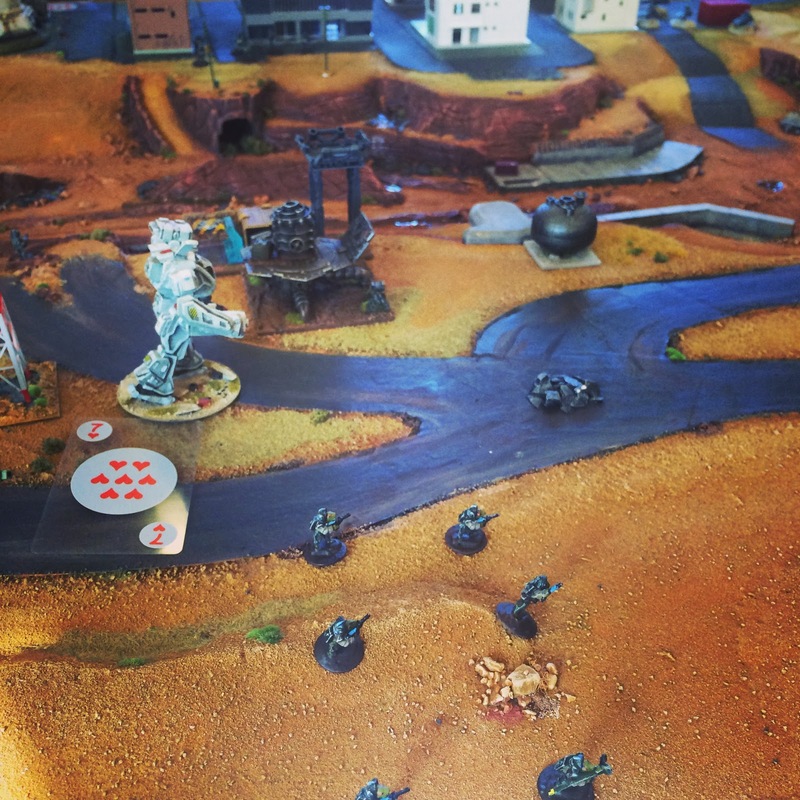 It made them very tough as a Gruntz squad but not tough enough to survive an accidental "Snake Eyes" failure roll when placing on the demolition charges which ripped through he squad leaving only a couple left alive with their shields. Here the Garn are trying to lay the demo-charges on the bridge supports. Unfortunately the Drop Pod (from Clear Horizon) deviated away from the drop zone and landed on the centre of the bridge. They were then able to dish out some damage to the surrounding EHTC forces but were not in a good position to lay demo-charges which were needed on the supports below. You can see the drop pod on the bridge and the small amount of Garn that did drop in at the right place on the dry riverbed. The defenders were mostly GZG models representing the East Hyadum Trade Company EHTC). The EHTC are like the early East India trade company, a British interest with a private army spanning several systems. 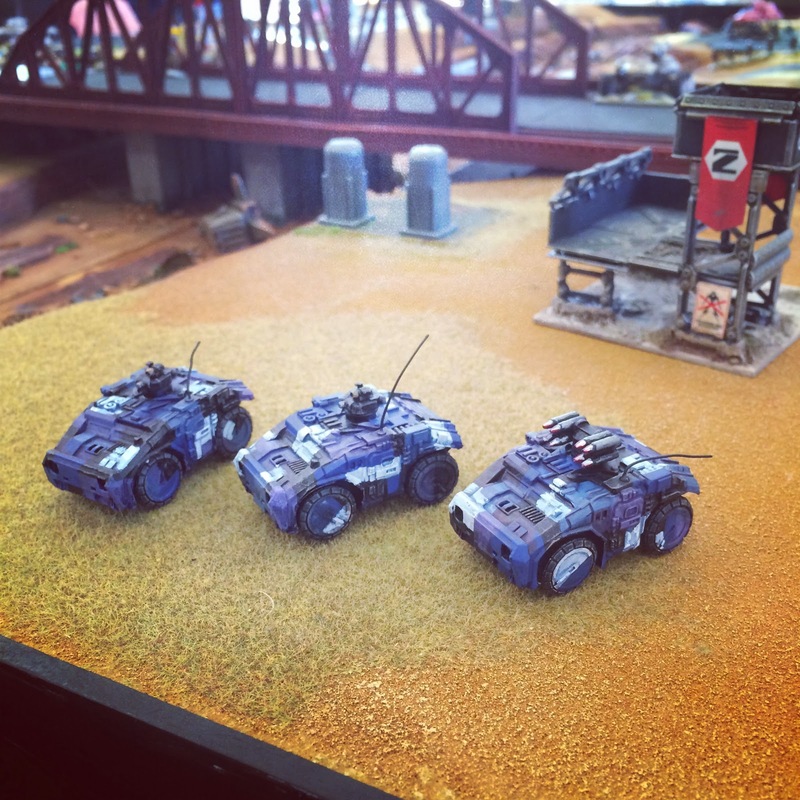 I used GZG "NAC" troops painted in the traditional red colours and combined them with a mix of hi-mobility wheeled vehicles from GZG. The Garn never managed to finish the job but they did disable the secondary objective of knocking out a power distribution centre. 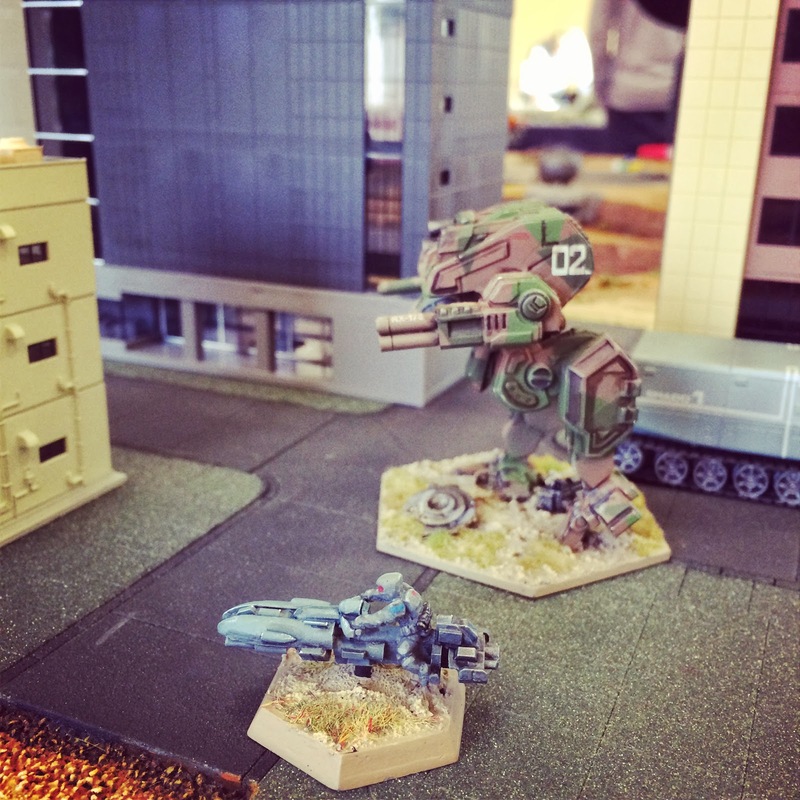 The building rules were used from Gruntz to provide a damage factor for the destruction of the objectives. So a partial victory for the defenders who did a sterling job of keeping the Garn at bay. It was a great event and now I have just one Month to go before the big Salute convention on the 12th April. 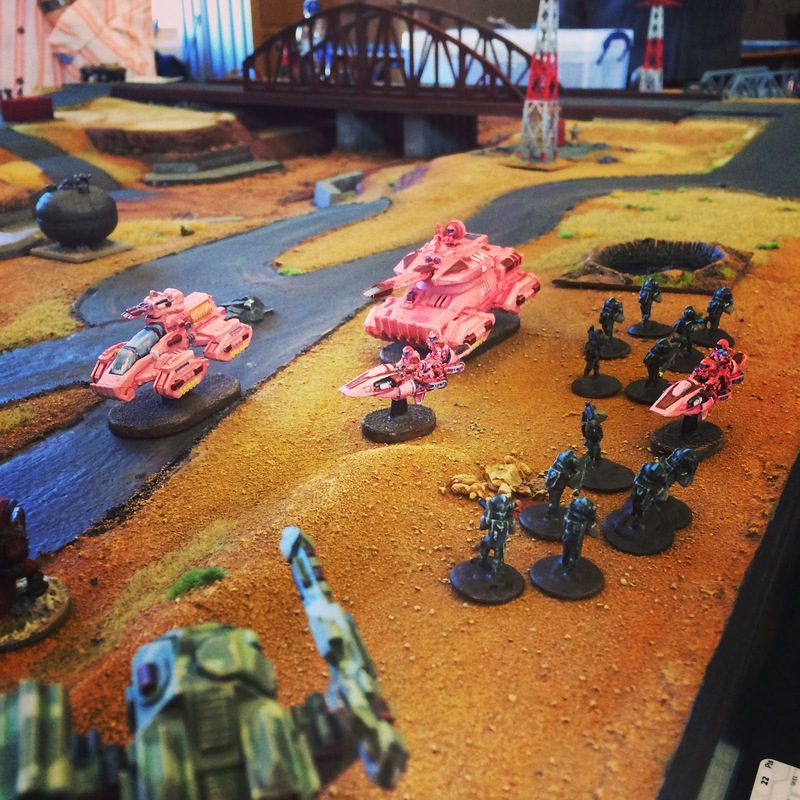 This is a single day event where I will have a couple of Gruntz terrain layouts for people to have a go on and people are welcome to bring forces of their own with pre-made profile cards. 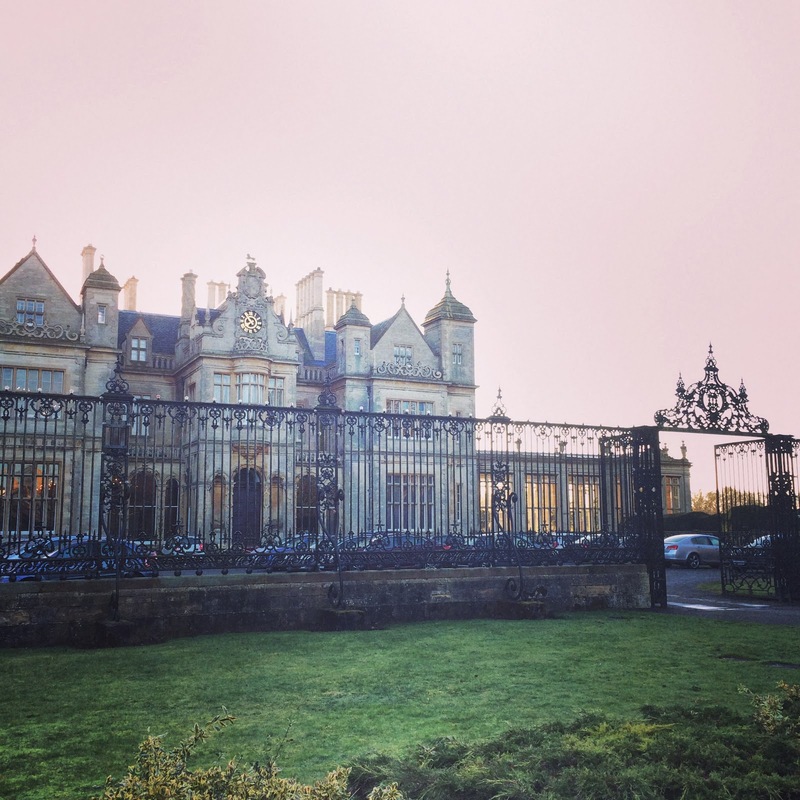 Here are some further photos from the Stoke Rochford weekend. Looks like a lot of fun, and great pointers for the skill and shoot levels.